My lunch consists of an entree + a vegetable and fruit side (1/2 portion each). Naturally, I usually do not get through all of that food during lunch as my entree is always pretty hearty and filling, but I do eat some of the sides. Later, when I get hungry again I tend to finish the sides, but I am still a little hungry and this is when my snack comes into play. 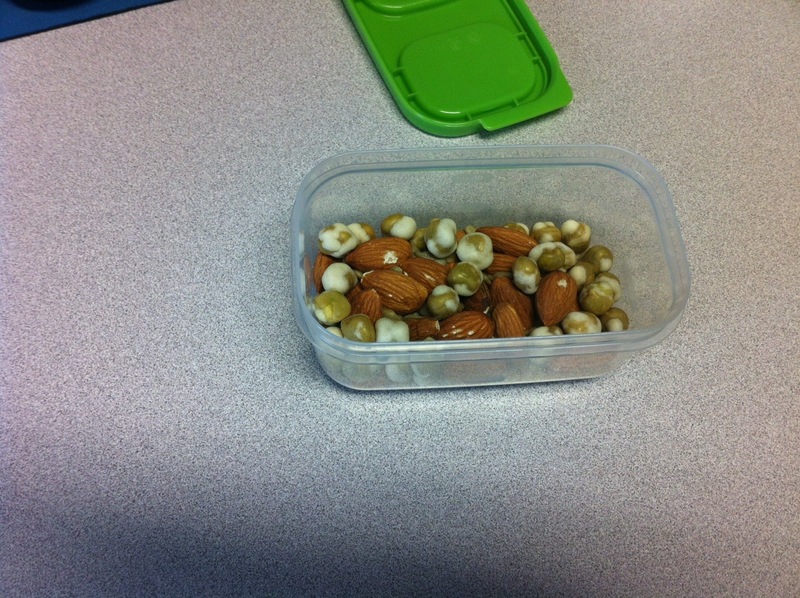 As you may be able to tell above, my snack is nuts, seeds and wasabi peas. Why? Well, I should really eat nuts and seeds every day as they are full of Omegas, protein, fiber and other vitamins, however it has been hard figuring out how to get them in alongside everything else you are supposed to ingest each day. I thought to myself, what better way to ensure I get my Omega’s each day than to take them as a mixed nut snack. So I put together a portion of nuts, a portion of seeds and wasabi peas because I like a little bite and sugar in my nut mixes. The nuts I like to keep around are Peanuts, Almonds, Pecans or Walnuts. The seeds I tend to go for are Sunflower or Pumpkin (I want to try flax, but I’m scared!). I keep myself stocked up on Wasabi peas by way of the bulk foods section in health food stores. I do not add any dried fruits because I bring fresh fruit with me and that would just drive up the cost.